I wish I could blame it on that. a birthday popped up on my computer so i started a thread. then i realized it was about a week too soon and i couldn't figure out how to delete the damned thing so i just edited it. i sell insurance for a living what do you guys expect. Ohhhhh nice try Bad Brad!!!! Is THAT why today's tech help is outsourced to India?? It took me about an hour to click on the "!" 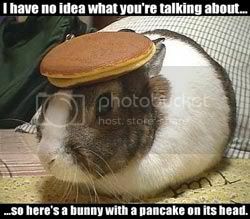 Someone nailed me with the pancake bunny years ago and I feel off my chair. You don't have to tell everything you know Brandon. Ok, I was drunk. You feel better now. It's icy and I had cabin fever. There are several birthdays to celebrate this week! Ya'll be safe I'm headed to the Pacific. Wish we could stay, have fun! Happy Birthday to OU WANT SOME?!! Wish me a Happy Birthday? ?